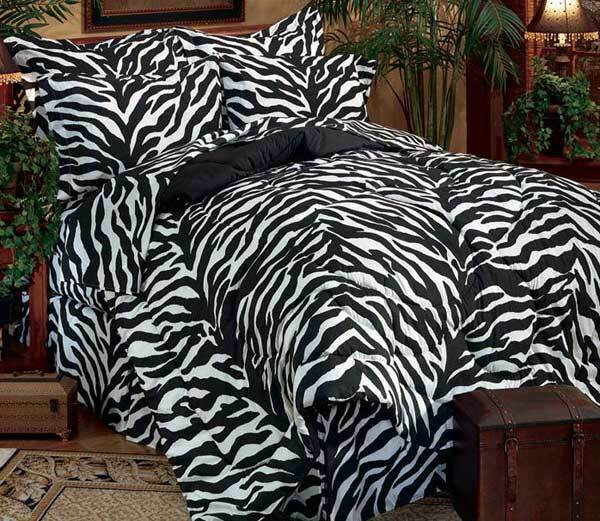 Traditional Black & White Zebra Animal Print Bedding by Karin Maki of Kimlor Mills. A favorite Zebra look for anyone. The black & white zebra backdrop brings out the details of the black zebra stripes. Black/White Zebra Bedding is available in Twin, Full Queen and sizes, also available are decorator pillows, daybed ensembles, shower curtains, valances and rod pocket curtains. Complete bed set includes: comforter, bedskirt , pillow sham(s), flat sheet, fitted sheet (fits up to 13" mattress) and pillowcase(s). Proudly constructed in the U.S.A.